No doubt, for a handful of people a divorce is a freeing moment, and a cause for celebration. But, this is not the major emotion felt by the majority of those who experience this life-changing event. Divorce is the second-most stressful life event for an adult, scoring a 73 on a scale of 100 in the Holmes-Rahe Stress Scale (the most stressful event, at a score of 100, is the death of a spouse). Since the wedding ring is the symbol of the union with the spouse, the removal of that ring is also symbolic of something now missing. Many people elect to replace the wedding ring with another ring which also holds symbolic meaning, using it as a constant reminder of hope which works against feelings of despair. 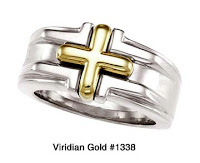 At Viridian Gold, we do not have any rings that are specifically "divorce rings", but some of our customers have apparently considered some of our rings to be good for that purpose. 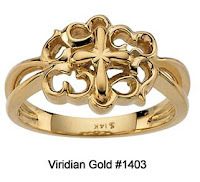 Recently, a friend of ours in another state ordered the Filigree Rope Cross Ring, #1403 in the weeks prior to finalizing her divorce from her husband of almost 30 years--suffice it to say that we know for a fact that this event is very traumatic for her, and there is absolutely no hint of "celebration" in her emotions. Instead, this ring will serve as a reminder to her of the One who is "the same yesterday, today and forever," even when all else is falling apart. Many of our religious rings can serve this purpose for men and women who are experiencing the pain of divorce, even many of those rings that we have labeled as "wedding rings." Unbeknown to us, I suspect that a few of the religious rings that we have sold over the years have been used for just this purpose. As long as the ring reminds the wearer of the bedrock of their faith, then it will serve it's purpose of assisting it's wearer in the process of becoming single again. And, if the wearer remarries, the ring can be re-sized and moved to the other hand or given to a friend who is going through a divorce. We have collected a few of our ring styles which could be used as "divorce rings" for those of the Christian faith, to fill that "empty finger". Ask us about custom jewelry!